The city of Paris welcomes visitors with thousands of lights and decorations in its most beautiful winter season. Paris Christmas markets give shoppers the traditional atmosphere that directly dive them in a holiday season. Sometimes starting in mid-November, these attractive fairs have everything a shopper needs. From drinking to dining, but also products of crafts, beautiful gifts and creative objects. In the city, more than 125 squares and streets are decorated with garlands, Christmas trees, multicolored Christmas bulbs and lights of all kinds. Among the most beautiful illuminations, you will find the Champs-Elysées, Montmartre, Boulevard Saint-Germain, rue de Richelieu, Place Vendôme, Forum des Halles and the Eiffel Tower. In this article, you will find everything you need to know about Paris Christmas markets and events. We will keep updating the content as some announcements arrive later in November. Until now, here are the events that you should not miss if you’re in town! After being on the Champs-Elysees for years, the biggest Christmas market of Paris is moving to the Louvre’s Tuileries gardens. Mulled wine,cotton candy, handmade crafts will be the most eye (and tastebuds!) pleasing attractions. Wander in one of the most beautiful gardens of Paris while savoring Christmas treats. How to get there: Tuileries gardens, 75001 Paris / Metro: Concorde or Tuileries (both on metro line 1). The charming Notre-Dame Christmas market celebrates France’s artistic artisans and is made up of 30+ exhibitions dedicated to arts and crafts. It is located right next to the cathedral of Notre-Dame, on the square Viviani (quai de Montebello) which houses the oldest tree in Paris (+ 400 years). In a warm and authentic Christmas atmosphere, you wander among artisans while drinking mulled wine and your children will write their letter to Santa Claus (free workshop). At the foot of the Eiffel Tower, an icy activity awaits you. The Christmas skating ring will take place again under the fairy-tale decoration of the Iron Lady and offer you a gentle pause near the chalet’s terrace. Animations and tastings – marshmallows on barbecue, tartiflettes – are also on the menu. 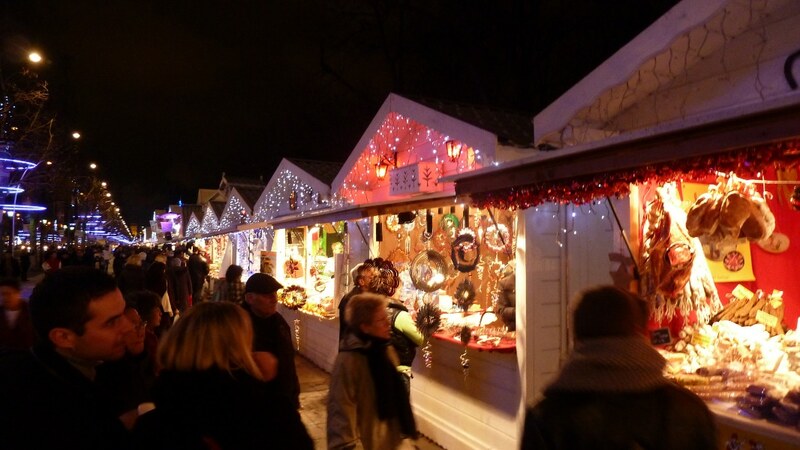 This is the first year of the Hotel de Ville Christmas market! Before 2018, there used to be a huge ice ring in front of this beautiful monument. It was eventually shut down for ecological reasons and replace with an equally festive event. You will also see a Christmas village and you will be able to purchase typically Parisian and “Made in France” products. Be there or be square! Opening: From December 14, 2018 to January 6, 2019. Another lovely Paris Christmas market. This year, all the Alsatian Christmas traditions are celebrated in this typical Alsatian Christmas market. On the square of the Gare de l’Est, you can savor wines of Alsace, cakes, gingerbread, sausages, sauerkraut and many other Alsatian gastronomic products. Located at the foot of Saint Germain des Près’ church, this Christmas Market is made up of a series of ephemeral boutiques (roughly 30) offering unique and original products made in France. It’s a small one but worth a stroll! The 13th arrondissement also has its Christmas market. The Italie 2 shopping center, located at Place d’Italie, will display about twenty chalets during the Christmas holidays. Special gifts and other delicacies can be found as you wander with your friends and/or family, away from the crowds. Like every year, Disneyland Paris will celebrate Christmas spectacularly. You will find many events such as horseback riding, Royal Christmas wishes at the Castle Theater, Mickey and the magic of Christmas lights, meetings with Santa Claus and much more! This year you will be able to iceskate in one of the most emblematic monuments of Paris near the Champs-Elysees: the Grand Palais. Put on your ice skates and admire the beautiful lights and Christmas atmosphere at display under a marvellous ceiling made of glass and iron. Noël Gourmand is a fair dedicated to authentic, healthy and high-quality gastronomy. It is held in a prestigious place where all the exhibitors are producers presenting their stands! The first two editions took place at the Palais BRONGNIART, Place de la Bourse and then the two following at the Carrousel du Louvre and this year – like last year, the 6th edition, will be held at the Cité of Fashion and Design (Cité de la Mode et du Design). Our goal at Meet The Locals is to provide Paris tours during which you truly explore and discover the city from a local’s perspective. Have a look at our Paris Christmas Tours to make the most of this festive period!